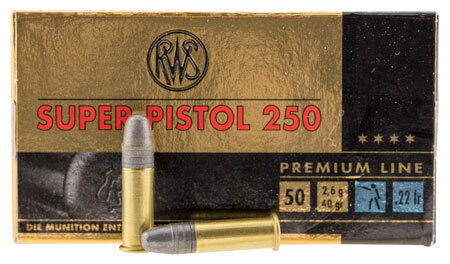 Walthers Super Pistol 250 rimfire cartridge from RWS is a soft shooting but still reliably functioning ammunition for sport and standard pistols. Its extra soft shooting performance allows a very good sighting control even with extremely short shooting intervals. This smallcalibre ammunition is ideal for the Olympic rapidfire pistol. With a bullet weight of 2.6 g it complies with the regulations of the ISSF and it usually achieves the demanded minimum velocity of V0 250 ms.